Did you know that eating more whole grains, like ancient grains, can help prevent type II diabetes, stroke, and heart disease? Ancient grains, seeds and oil seeds that are often enjoyed like grains can include quinoa, amaranth, flax, millet, oats, buckwheat, and chia. Whole grains and seeds can be rich in satisfying protein, fiber, and healthy fats, which can help you stay full longer and maintain a healthy weight. There are also long-term benefits as they help prevent strokes, diabetes, heart disease, and cancer all while increasing that full feeling that helps curb weight gain. Some of my clients who suffer from migraine headaches or have rheumatoid arthritis have found a marked improvement in their disease symptoms by choosing gluten-free grains. Ancient grains have been around for over 8,000 years! They’ve gained recent popularly because many are gluten-free. With an increased awareness of Celiac disease, gluten sensitivity, and general interest in gluten-free foods, ancient grains have been making headlines. The best part is that these grains are high in fiber, protein, vitamins, minerals, and contain healthy fats! As a kid, my mom cooked and baked with many of these! I loved millet and have been teaching functional foods courses highlighting the abundance of phytochemicals and nutrients in ancient grains for over a decade. So I’m glad to see they’re finally getting the recognition they deserve. There are many ways to prepare ancient grains to add flavor and texture. Try a bowl of chia soaked overnight in non-fat milk or nut milk and sprinkled with cinnamon for a breakfast that will keep you satisfied all morning. I love ground gluten-free oats -as they add a very light taste almost like white flour. Try these gluten-free zucchini oat muffins. 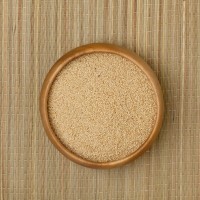 Amaranth adds a nutty taste when added to ¼ of the whole grains used in baking. Quinoa is a great substitution for pasta or added into breads. Quinoa and millet are delicious with slivered almonds and chopped dried apricots or cherries. For more savory dishes try adding seasonings and spices. I cook my Ancient grains in my rice cooker! Myth: Whole grains, like ancient grains, are not part of the Paleo diet and are difficult for our body to process. Fact: Whole grains provide essential B vitamins, Magnesium (many Americans don’t get enough of this), and a variety of phytochemicals that fight cancer. Cancer prevention starts with kids and in addition to other plant foods like fruits, vegetables, nuts, seeds, and beans, whole grains should be included in children’s daily diet. Myth: White rice should be consumed because it’s easy to digest. Fact: Ancient grains are nutrient powerhouses. One cup of uncooked amaranth has 13 grams of dietary fiber, as much fiber as 6 cups of uncooked white rice. If you have problems with digesting fiber, add it slowly and gradually along with plenty of water. A high fiber diet is anti-inflammatory –and inflammation contributes to most diseases! So take time to get adjusted. Plus fiber helps diversify your gut bacteria improving your immune system! Myth: Ancient grains are high in calories and whole grains contribute to weight gain. Fact: Ancient grains can help you lose weight because they contain fiber, fat, and protein, which together promote satiety. Incorporating whole grains into your diet will not make you gain weight unless you eat too much. Research has shown that replacing refined grains with whole grains is actually associated with a lower body weight. Myth: Ancient grains will make you bloated. Fact: Reduce bloating by gradually increasing fiber along with water. If bloating does occur during your transition to a high fiber diet, try chamomile or peppermint tea to reduce your symptoms. Say yes to ancient grains! These can be a tasty part of a diet that contributes the key nutrients that you need for good health and longevity. Read 10 ways to enjoy ancient grains, featuring easy quick snack and meal ideas!